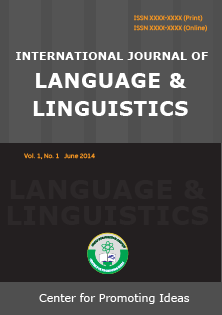 International Journal of Language and Linguistics (IJLL) is an open access and double blind peer reviewed international journal published by Center for Promoting Ideas (CPI), USA. The main objective of IJLL is to provide a platform for the international scholars, academicians and researchers to share the contemporary thoughts in the fields of language, literature and linguistics. IJLL aims to promote interdisciplinary studies in language, literature and linguistics and thus become the leading international journal in language, literature and linguistics in the world. The journal publishes research papers in the all the fields of language, literature and linguistics such as fundamentals of languages, ELT, the sounds and words of language, structures and meanings, language and gender, sociolinguistics, English syntax, historical linguistics, origins/evolution of language, experimental linguistics, phonology, endangered/minority languages, language and nature, communicative strategies, linguistic anthropology, linguistic analysis, language and alienation, Hispanic linguistics, analyzing Chinese language, philosophy of language, psychology of language, field methods in linguistics, history of the Spanish language, Spanish dialectology, applied linguistics, language, brain and society, advertising and propaganda, phonetics, morphology narrative and memory, thinking and writing across the curriculum, literary research methods, literary discourse, British literature, American literature, professional writing, conflict and community, studies in trauma literature, creative writing, critical writing, african literature, literature of American diversity, American fiction, the epic tradition, biographic arts, women in literature and psychology, film and literature, romanticism, Victorian literature, world literature, and so on. IJLL publishes original papers, review papers, conceptual framework, analytical and simulation models, case studies, empirical research, technical notes, and book reviews. Special Issues devoted to important topics in language, literature and linguistics will occasionally be published.